As noted in the past, coach Jim Boeheim is from Lyons, New York. Lyons, located in Wayne County, is firmly part of the Rochester metro area. While sports teams tend to have a markedly overhyped direct economic impact, it cannot be denied that they help with civic pride and regional branding. They may also have a harder to measure indirect economic impact by making an area seem more desirable to at least a certain number of people. Despite our governor's fascination with in-state economic competitions, the reality is that during these global times, Rochester is not so much competing with Syracuse and Buffalo as it is with other states and other countries. A broader view of development and branding makes sense, especially given that the Rochester, Syracuse, and Buffalo Combined Statistical Areas together have about 3.1 million people, i.e. more than 20 states. Perhaps the regional brand could be "The 2-3 Zone" as in 2 Great Lakes and 3 Underrated Cities. Okay, maybe not. Regardless, the growth of Syracuse and Buffalo are perhaps critical for the success of Rochester. It's a good excuse to drink local beer. With a population of 2.8 million, the city of Toronto is the fourth largest in North America. If diversity is of interest to you, the over 140 different languages spoken in the city might be appealing. Rochester, thanks to Buffalo and Syracuse, has easy access to the NFL, NHL, the highest level of NCAA basketball, and the highest level of NCAA football. Toronto completes our big-time sports package by providing MLB, NBA, and MLS. Spending a few hours in traffic on the Queen Elizabeth Way serves as a nice reminder why living in Rochester is phenomenal. While all cities are rooted in their history, few can take as much pride in their past as Rochester. In Rochester, Frederick Douglass found an environment suitable to publishing his abolitionist newspaper The North Star, and his life inspired the country's first monument to an African American. His friend, Susan B. Anthony, used Rochester as her home base in her fight to earn women the right to vote. This culture of forward thinking has defined the region, and it has manifested itself in a wide variety of arenas. A perfect example can be found in Rochester's sports history. Jackie Robinson's historic 1947 debut with the Brooklyn Dodgers of Major League Baseball was captured in the 2013 film 42. Don Haskins, whose Texas Western team comprised of five black starters beat all-white Kentucky in the 1966 NCAA men's basketball championship, had his story retold in the 2006 drama Glory Road. In 1946, the Rochester Royals of the National Basketball League, which would later merge with the Basketball Association of America to form the National Basketball Association (NBA), became one of the first teams to sign an African-American player, William "Dolly" King. In Lloyd's hilarious own words, it was too cold for the Ku Klux Klan. Some of the nation's best public schools along with some of the nation's most educated residents. Arts and cultural offerings which on a per-capita basis can match almost anywhere in the country. A beer and coffee scene that is vibrant by any standard. A proud history of forward thinking and open-mindedness. All of the above while having some of the shortest commute times among metro areas with over one million residents. All of the above while providing the second most affordable housing among 52 major U.S. markets. Chinese food on par with Chinatown in San Francisco, where 21% of residents are of Chinese ethnicity. Mexican food options available in El Paso, Texas, which is as close to being in Mexico without actually being in Mexico as possible. Double or triple the number of watering holes, as might be found in regions with double or triple the population. Expecting a $600-per-month one-bedroom apartment in Manhattan. Expecting a 10-minute commute in Washington, D.C. Expecting 70-degree weather in January in Chicago. Expecting people in Kentucky to appreciate science (my wife is from there so it's all good). Job Market received 20% weight. Value, a measure of income relative to cost of living, received 25% weight. Quality of Life received 30% weight. Net Migration received 10% weight. These five indexes were then combined into an overall score which ranged from 0 - 10. With an overall score of 7.8, Denver took the #1 spot. With an overall score of 6.5 and a ranking of #60, Rochester's performance was, well, average. A closer look at the analysis shows a few encouraging signals. As an example, Rochester's position outranked major metro areas such as Atlanta, Philadelphia, Los Angeles, Chicago, Miami, and New York City. Furthermore, the separation between metro areas seemed rather minimal. With a score of 6.5, Rochester was ranked essentially on par with #52 Spokane, WA. In fact, a slightly higher score of 6.7 would have placed Rochester at #28 along with Richmond, VA. However, by far and away the most encouraging signal comes from manipulation of one index, namely desirability. This index was essentially a popularity contest based upon a survey asking people where they would most like to live. Denver's stellar overall performance was in large part due to an extremely high desirability index. 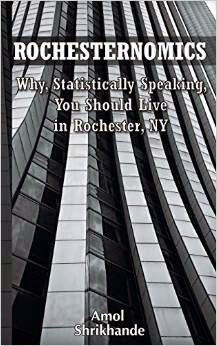 Hypothetically, if Rochester had achieved the same desirability index as Denver (and kept its other four indexes exactly the same), Rochester's overall score would have increased to 7.1, placing it alongside #8 Washington D.C. and #9 San Francisco. What is the point? Branding and perception can make a huge difference. So if you happen to be a Rochester detractor, PLEASE stop. You're dragging the rest of us down. Nordstrom, which I have never been to, is an upscale retailer that is not located in Rochester. To be precise, it is not found in 12 states. As a substitute, Rochester has Von Maur, which I have also never visited. Tiffany & Co., per Wikipedia, is renowned for its luxury goods and is particularly known for its diamond jewelry. I'm pretty sure Rochester has jewelry stores. Louis Vuitton sells purses for around $1000 each. Is that a good thing? Prada...I thought that was a movie with Meryl Streep and Anne Hathaway. West Elm...actually we have that one. Wegmans is headquartered here, I believe.